I know, I know, I’ve said it a gazillion times, I don’t really do the girly pink thing for Valentine’s Day. Having two 8-year old girls in the house over Valentine’s Day weekend quickly changed things. My friend’s daughter, Lexi, and her friend were with us this weekend which compelled me to get in touch with my girly, glittery, and pink loving side. For breakfast I indulged them in pink, heart-shaped pancakes which evoked little 8-year-old squeals and lots of photos on their iPods. We did the whole shopping, lunch, and picking out Valentines thing and I decided that I couldn’t let the weekend pass by without making them a sweet and yes, girly Valentine’s Day dessert. At first I thought I might do something delicious and simple like my No Bake Cookies, but then I decided to really go with the holiday theme. I have made this recipe for Red Velvet Cake countless times. It’s adapted from the New York Times, and in my opinion, is one of the best Red Velvet recipes out there. 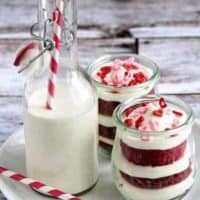 Instead of making a traditional cake or cupcakes, I thought I’d jazz up this sweet treat by layering slices of cupcake with cream cheese frosting in my favorite Weck Tulip Jars. Finishing them off with a sprinkling of pink and red heart-shaped candies gave them a swoon-worthy finish. Whether you’re baking for 8-year olds or your sweetheart, I’m fairly certain that just about anyone will fall head over heels for Red Velvet Cupcakes in a Jar. This cupcake recipe has been scaled down from the original recipe by The New York Times. Just wondered if you can send Weck Jars through the mail? Yes, you can order them directly through Weck’s website. Have a great day! Just wondering if you can send filled weck jars through the mail? Do you mind if I copy this idea? I want to send cupcakes in the mail, and this seems like the easiest way. Sorry meant to say for my business. I LOVE the straws! Where did you get them? The straws were purchased from Bake It Pretty. Thanks for stopping by. Great idea, but how about using clear, plastic cups instead of jars. My kids take them, eat them, throw them away – no dishes to wash! I used a gel food coloring from Wilton. Thanks for stopping by. 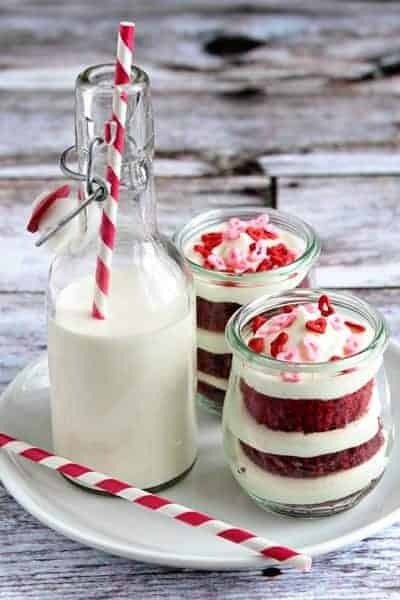 Wow, I love cakes in jars or glasses, I love baking in my wonderful WECK glasses and I absolutely love to make these cupcakes. This velvet colour is amazing!!! Hello! I was just looking for a great red velvet recipe and I always find great recipes from your website :) But, I was comparing your two recipes for just the plain cupcakes and these in the jar–you used two different measurments of cocoa powder—did you notice a difference? Was it just for color? In your opinion, what would be the BEST (of your two recipes) for a traditional red velvet cupcake? The cocoa powder was reduced a bit simply due to wanting a more vibrant color red. There really wasn’t a noticeable difference in the flavor at all. Have a great day! I love red velvet cupcakes and this is a really fun way to serve them. The presentation is delightful. I am very familiar with the Weck Jars; they are my preference for canning. Could you please let me know where you found the glass milk bottles. Thanks so much for stopping by. The glass milk jars were actually purchased at my local market – they are used for self-service olive oil and balsamic vinegar. I have also seen something similar at World Market. Have a great day! Hi Jamie, these look lovely! You don’t get cake flour easily in India so can I use regular flour with baking soda instead? Hi, Can you please tell me where you bought the bottle from? it’s so cute. Hi Lochy, that is from Cost Plus World Market. Great idea! What size Weck Tulip Jars did you use? Thank you. They are 762 – 1/5 Weck Jelly Jars – I hope this helps. I realize I’m late to the game on using the jars!! I have been wanting to try it for a long time. What size jars do you use? Thank you so much!!! The Jars are Weck 762 – 1/5 Jelly Jars – I hope this helps! What size tulip jars do you use? I used the 762 – 1/5 Jelly Jar. I hope this helps. Hi, Super lovely! I want to make them as party favors for my Christmas party so I will use plain old canning jars. Do these need to be refrigerated? I assume they will only be good for a couple of days before getting stale. Thanks for your posts! Yes, I would recommend refrigerating them before serving. Thanks for stopping by! I think they would be fine shipped during the cooler months of the year. I would would probably use an express or overnight shipping option. Thanks for stopping by. I am thinking of baking it as a cake instead. What size pan & what would the temperature & baking time be? This would make an 8×8 square cake, or perhaps a thick 8″ cake. The temperature would stay the same, but the baking time would increase to 45-55 minutes. Start checking the cake after 45 minutes with a toothpick. When it comes out clean, the cake is done. Its looks very dilicious … yummy .. i’ll try at my kitchen! This will make about 12 servings. I hope this helps and I appreciate you stopping by. Hi again! I was wondering if I can use all purpose four instead of cake flour? You can make cake flour by removing 2 tablespoons from 1 cup of all purpose flour and replace it with 2 tablespoons of cornstarch. Sift the mixture together five or six times. I hope this helps. I’m so glad to help. Thanks for stopping by. This is such a cute idea and I really want to do it. I really love the glass milk bottle; if you could just tell me where you got those. Thanks so much! If I remember correctly, I got that at Pier One Imports. Thanks for stopping by! I really love the idea of using jars and the straws are very nice. cant wait to try the cup cakes. they look delicious. 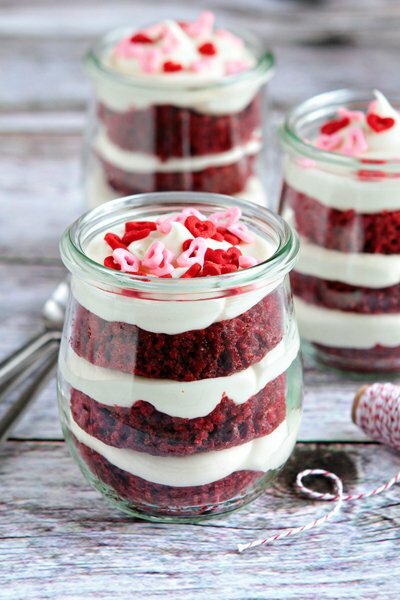 Jars do make a fun presentation for desserts. Thanks for visiting. Oh my goodness. Please pass the milk! I invite you to share at my blog hop ( you can link up until Sat night) Hugs! Hi Jamie :) can i store this in norm room temp, with the jar sealed? How long can this be kept fresh in fridge? I would store them covered in the refrigerator until ready to serve. They should be fine for 2 to 3 days. I hope this helps. These little cakes are just too”sweet”! Putting them in jars is genius. We can’t wait to make! Thanks for sharing! Hi, Trina and Tina! I hope you enjoy them! can i use the this recipe for makeing redvelvet cake ?! Hi, Esra! I think you should double the recipe if you want to make a full cake. I think it should work out fine. I hope you enjoy it! Weck jars are beautiful but I can’t afford them. They are quite lovely, Pamela! Hi, for the granulated sugar, is it 3/4 cup? Hi, Miley! Yes, it is. Thank you for catching that! Yes, I would refrigerate them due to the cream cheese. Happy Holidays to you and yours! Made these exactly to the T twice this year for V day and after! Was trying to bake it as a 2-3 layered 9 inch cake but can’t figure out if doubling or tripling the receipe would be a good idea. Any tips?? Hello! I haven’t attempted scaling this recipe, so I am not sure of the result. If you happen to give it a try, I’d love to know how it turned out. Thanks so much for stopping by. Also, I do see it’s scaled down from The NY Times cake recipe but it seems you didn’t add butter in yours, whereas they did. Haven’t tried their’s — but loved yours, so confused! Have to bake for a birthday cake tomorrow!